Ever since reading a couple of articles about the Texas Star Party in the October 1995 edition of the Webb Society’s Deep Sky Observer I have wanted to go to it. For a north western European, and especially UK, observer for whom observing can be a frustrating waiting game given Britain’s notoriously inclement maritime climate and bad light pollution (62 million people overcrowded into a tiny archipelago less than a third the size of Texas certainly put out a lot of light in a small area) the TSP, which has a higher – though certainly not 100% guaranteed – chance of good observing weather, is a highly sought opportunity and legendary amongst Europeans . So, after eleven years I finally made it over there for the 2006 event. I originally planned to go to the 2005 one, but I had to pull out and, as it turns out, this was just as well because apparently the weather and conditions were awful that year with only a few hours’ observing time over the entire week. 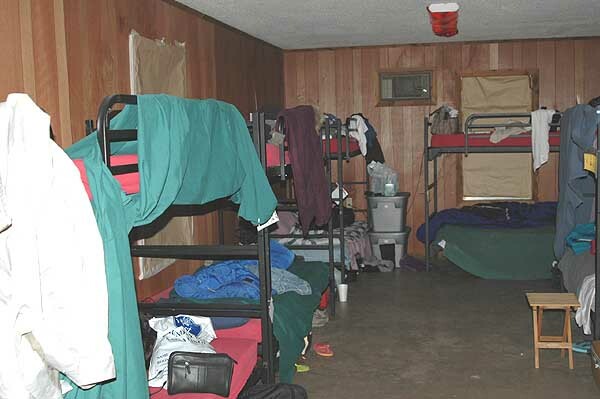 I registered for TSP 2006 in December and was allocated, as requested, a slot in a bunk house. I booked my flight with Northwest Airlines in January and flew on an elderly DC10 to San Antonio via Minneapolis on Sunday 23rd April where I was met by Robert Reeves who was giving me a lift out to the Prude Ranch where TSP is held. Monday was spent looking round San Antonio and also visiting the famous Alamo, which was much smaller than I expected. On Tuesday, Robert and I left at 0730 for our long drive out to the Ranch in the Davis Mountains. The drive, with frequent stops, took eight hours and we got to the ranch mid afternoon, the latter part of the drive being through some beautiful scenery, which was mile-high desert. After dropping my belongings at the bunkhouse it was time to look round. I headed for the vendors’ hall and bought some nice astronomy-related t-shirts; Robert had also made his way there and introduced me to Barbara Wilson who was absolutely delighted that I had come all the way from England just to attend TSP. I visited the vendors’ area several times during TSP and came away with some TeleVue equipment – a 3mm Radian and a 2.5x Powermate. I also bought a 5mm Radian from Alvin Huey later in the week, nice, useful souvenirs to take home! By then, it was time to go and register for the star party as registration didn’t open until 1630. I bought a TSP 2006 t-shirt, a TSP baseball hat (very useful for keeping the sun out of my eyes) as well as made a donation to Friends of TSP, which is a charitable organisation dedicated to keeping the TSP running year after year. 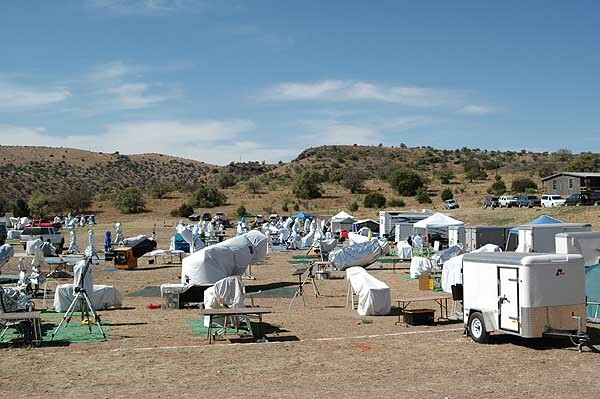 There were many telescopes of varying sizes on the three observing fields, but it was the upper field that was the most populous, being the TSP’s prime location. This is where I did all my observing from. Large Dobsonians, well represented by Obsession and Starmaster examples, seemed to be the most popular type although Schmidt Cassegrains and their relatives were also well represented and there were also a few smallish refractors. 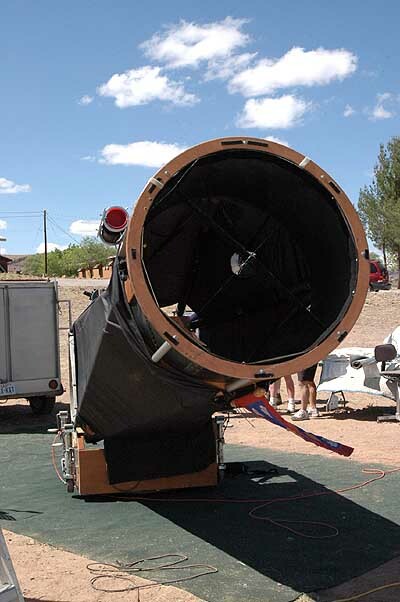 I must admit I would love to be able to afford one of these large Dobsonians, but the price of purchase and then shipping to the UK would be, sadly, prohibitive. Amenities: Well, the accommodation is pretty basic but as it’s cheap and I’m not that fussy anyway, it’s a good deal if you can ignore the loose toilet pans and lack of privacy! Besides it’s pretty comfortable and the ranch people do provide linen, which is something they didn’t in the past, apparently. The food’s not bad and there’s plenty of hot water available. Observing at TSP: Above anything else, TSP, is an observer’s event. It is not about the latest innovations or the most outlandish telescope design but is about observing. That is why people traipse across the United States and from further afield, for West Texas’ dark and – mostly – clear skies. 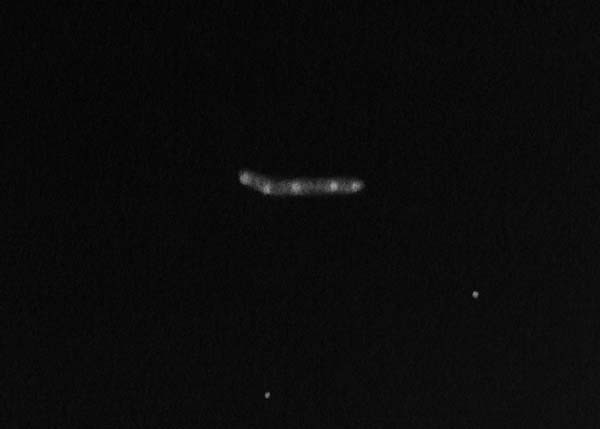 As far as observing was concerned Tuesday night was a complete cloud-out but, for me, this turned out to be a blessing in disguise. However, the next four nights had enough clear spells to guarantee lots of observing. Wednesday and Thursday nights had some cloud (but not enough to prevent people observing) but Friday and Saturday were as clear as could be and led to all-nighters. The earliest I went to bed on a clear night was at 0400 and that was on the Wednesday. On the first two nights I mostly used Alvin Huey’s enormous 30″ Dobsonian to observe Hickson Galaxy groups and Arp Peculiar Galaxies. We also has a shot at the Horsehead but as Orion was getting pretty low this was extremely tough and the Horsehead was extremely faint and I didn’t attempt to sketch it. I observed and sketched Hickson’s 40, 55, 57, 61, Arp’s 63, 94, 129, 137, 232 and 263 ( the latter was my favourite due to its shape, comparative brightness [in a 30″!] 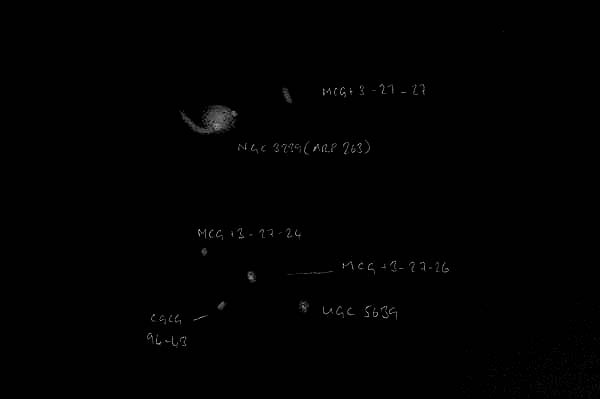 and its surroundings, lots of tiny faint galaxies with MAC, MCG, UGC, CGCG designations and so on. Wonderful!) plus I also had a look at Omega Centauri with the 30″ and that was extremely impressive and overwhelming. And no, there was NO chance I was going to attempt sketching that and besides I’d already done so, in a much tinier instrument in Australia in 1997. It had an almost three dimensional effect and I almost thought I could see right through the thing. I also got to look at the spiral structures of M51 and its little friend as well as M101 and I sketched these and very pleasing they are too. NGC 2359 (aka Thor’s Helmet), a nebula associated with a Wolf-Rayet star, was also observed and sketched and this reminded me of a football referee’s whistle more than a Viking helmet. 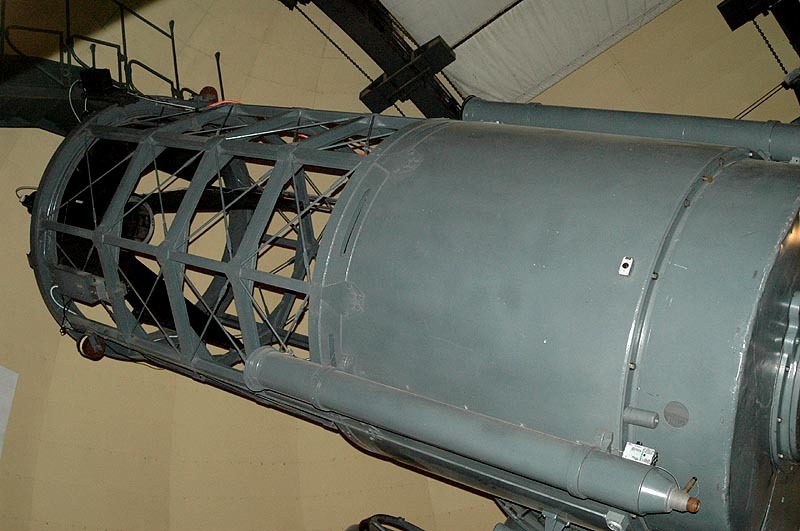 On Friday night, I got the opportunity to observe with Larry Mitchell’s vast 36″ Dobsonian. 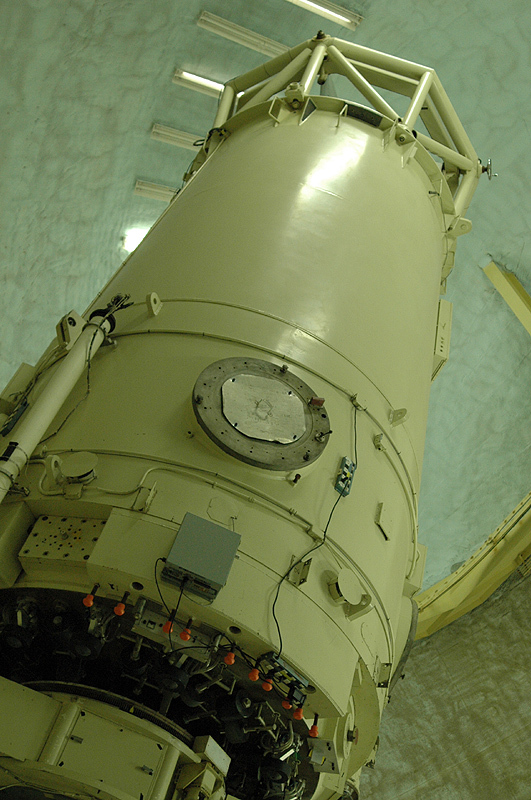 This is easily the biggest telescope I have ever looked through and was matched by a huge, but stable, stepladder. I joined in the fun of a search for Abell 28, a large and elusive planetary nebula in Ursa Major. After it was established that this was yes, definitely, the right field, we took it in turns to scrutinise the field of view. I think I saw some brightening in the right area, but not sure enough to say with 100% certainty that I made a positive observation. This thing is notoriously difficult anyway, so maybe it wasn’t surprising that we had a few problems with it. The fact that it was getting low didn’t aid our cause much, either. I put it down as ‘perhaps a definite maybe’. Next up in the 36″ was VV172, aka Hickson 55, a faint chain of five galaxies in Draco. I observed and sketched these with no prior reference to images and was pleased when Larry showed me a photo showing the five tiny nuclei exactly where I’d placed them in my sketch – “Man, you’ve NAILED ’em!”. Even more impressive is the fact that these tiny galaxies are actually 1 BILLION light years away. We also looked for and saw Herbig Haro 555, a jet of matter buried deep in the Pelican Nebula in Cygnus. I saw the tiny knot and part of the jet, it was very hard to see, but definitely there. This has to be the most exotic object I’ve observed to date and it was fascinating. After this, we decided to ruin our dark adaptation with a high powered view of NGC 4565 – all I can say was that this thing in the 36″ was awesome, filling the whole field of view and blazing brightly and bisected by its dark lane, providing a good contrast to the bright galaxy. We also saw NGC 6888, another Wolf-Rayet star nebula and this looked like silver filaments with a diamond at the centre – I’ve seen this with an 8″ in the UK but, of course, the views were incomparable to this. During my time at TSP, and with the exception of my binoculars (I used them to get a TSP observing pin), the smallest scope I used was an 18″ Dobsonian. 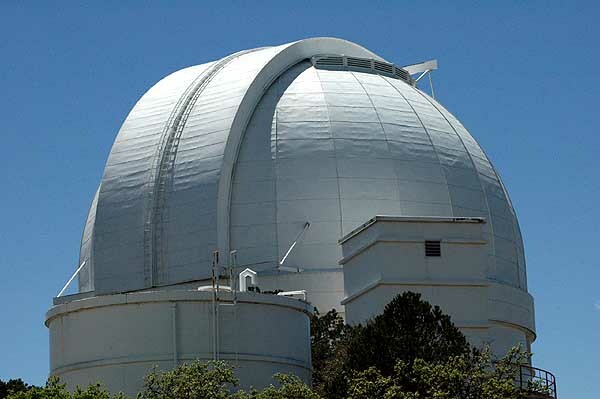 I used Barbara Wilson’s 20″, Alvin Huey’s 30″, Darrell Lee’s 18″, Anna Chandler’s 18″ and Larry Mitchell’s 36″, all of which are superb scopes and gave fantastic views. 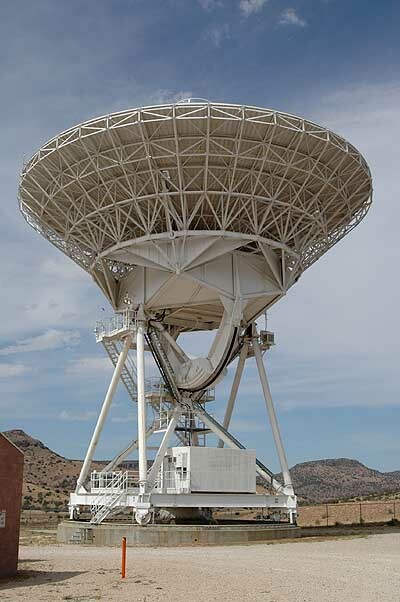 Nearby astronomical sites of interest: During the week I visited the Very Long Baseline Array radio dish which is adjacent to the Prude Ranch and Robert, myself and Ben Jones got a guided tour which included climbing up into the radio telescope itself. 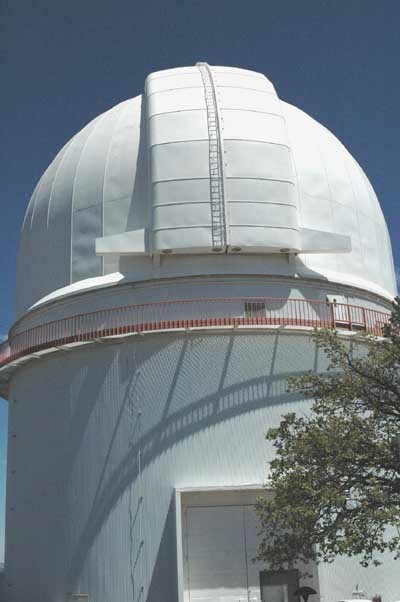 The following day I went on one of the TSP organised bus trips to the nearby McDonald Observatory on Mt Locke. This cost $11 but was worth the money for we got to see some world famous telescopes. 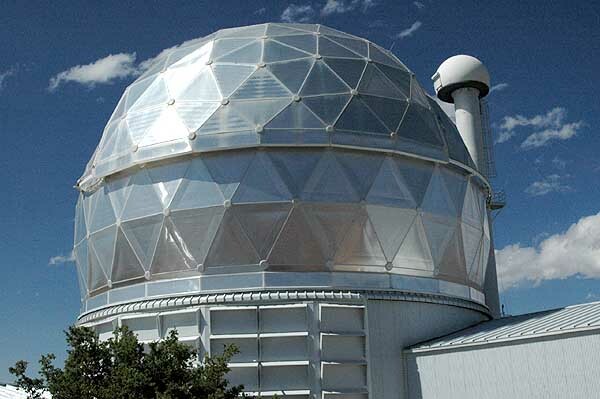 We went into the 107″, 82″ and Hobby-Eberly domes; although the latter is usually not open to the public, I suppose we got to go inside as we were considered a special-interest group and not just mere, slightly curious ‘Joe Public’. I have to admit the Hobby-Eberly talk about spectroscopy was not the most interesting (to me anyway) and I took a power nap against the base of the telescope itself – I was not the only one! That was the combined effects of a hot afternoon, just after lunch, and a very late night observing until 0400! Farewell Texas: All too soon it was time, not only to say farewell to the Texas Star Party and the many friends I met there, but also to Texas and the USA and very reluctantly fly back to England, light pollution and crap weather. The flight from San Antonio was not without incident as the jet starter didn’t work and they had to go fetch another (apparently this is a machine which gets air flowing through the turbines so the engines can be started) so we were late into Detroit and I had to run for my London flight – at the other end of the airport, of course – and I’m pleased to report that I made the flight with a few minutes to spare and I was also pretty relieved to be reunited with my checked-in bag at Gatwick Airport’s baggage reclaim the next morning as I had doubts about that making the flight in time! Conclusion: The Texas Star Party is the premier star party in the world and is well worth the time, effort and money invested to get there. 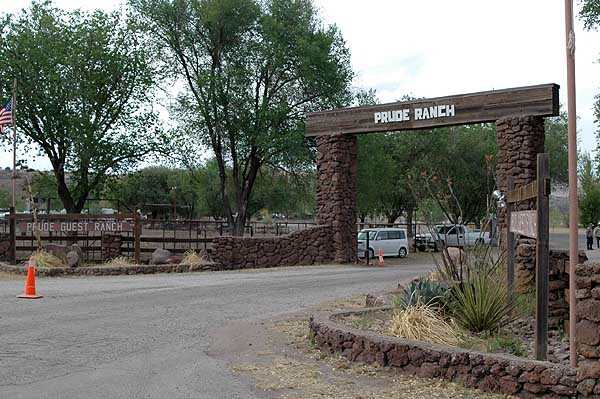 Ok, the Prude Ranch’s amenities are, well, rustic, but that is no problem. For me, it was an inexpensive and good-value-for-money vacation and indulging oneself in astronomy for a week, as well as meeting other observers, is too good an opportunity to pass up. I recommend that all serious observers attend at least once in their lives, it is well worth it and you meet some great people. As for me, I hope I can go again next year so I’m hoping airline fuel prices don’t rise too much, with their attendant ticket price rises. 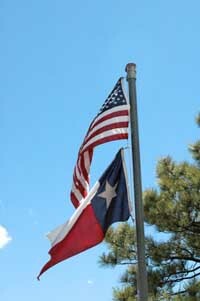 At the time of writing I have been home a few days and am missing West Texas already! There is one dangerous side-effect of the Texas Star Party – I now have a bad case of aperture fever since returning home and am wondering where I can acquire a 20″ mirror within the UK. I do have to confess that, while I love BIG SCOPES, I don’t think I would really want anything larger than 20 or 22″ aperture due to the fact that it would probably never get used. I did find that going up and down ladders all night is hard on the feet, but on the other hand that was a very small price to pay for the views I got. The best things about TSP? Well, the dark and – for the most part – clear skies, the talks, the scopes, the opportunity to buy astro gear at a fraction of the price you’d pay this side of the Pond, the scenery, the warm weather, the wildlife and, above all, the people. Other amateur astronomers are a joy to meet up and observe with and are generous beyond question when it comes to sharing their scopes and time; meeting, and observing with, some of the world’s best observers – Barbara Wilson, Larry Mitchell, Steve O’Meara, Alvin Huey et al was a real thrill. I also get a kick out of seeing how other observers observe, and there’s no better way to do this than at a huge star party. This, somewhat surprisingly given the distance to travel, was a pretty cheap vacation amounting to not much more than £500 all in, except spending money, and by whatever means I can I am determined to return for another TSP one day. Many, many thanks to: First and foremost to Robert Reeves for all his help and hospitality and the ride from San Antonio to Fort Davis and back; Robert’s sister Anita and her husband Chris (who suddenly had a stranger plonked in their midst! ); Barbara Wilson, Larry Mitchell, Alvin Huey, Steve O’Meara, Darrell Lee, Steph Hansen, Amelia and Steve Goldberg, Becky Ramatowski, Mike Planchon, David Moody, Len Philpott, Bob and Lisa Summerfield, Keith and Jan Venables and many others for making me feel welcome and being generous with their telescopes and observing time.